This fast moving, hardworking, multi-functional printer is perfect for busy workplaces where cutting down on printer space doesn’t mean compromising on printer speed times or cutting down on productivity. The Ricoh MP C306ZSPF is one of the most energy-efficient printers on the market, with best-in-class power consumption, yet still delivers when it comes to print speeds and functionality. Not only can you print off fast, high-quality prints from this machine, you can also fax, copy and scan. By far the best feature of the Ricoh MP C306ZSPF is its 10.1-inch colour touchscreen control panel. This innovative design feature works and feels much like a tablet so will be familiar and intuitive to anyone who uses a tablet or a smartphone. The large screen is a massive improvement on the smaller control panels that have previously dominated the market, and make for an incredibly easy and efficient experience, which in turn helps increase productivity and workflow. For such a workhorse of a machine, it is surprisingly compact, measuring 20 x 24.14 x 19.88 inches and weighing 45kg. There are any number of advantages when it comes to the Ricoh MP C306ZSPF, not least of which is its speed and efficiency. Considering the compact size of this printer, you might be surprised to find that it can reach print speeds of 30ppm in both black and white and colour, and that it has a warm up time of roughly 25 seconds, first print speeds of 7.5 seconds in black and white, and 11 seconds in colour. 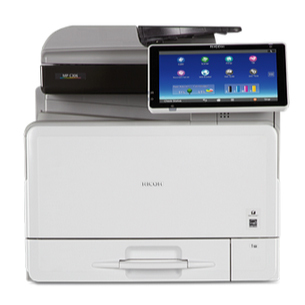 You can also use this printer with your smartphone or tablet by making use of the Smart Device Print and Scan app. You get the feeling that a fair percentage of the retail price of the Ricoh MP C306ZSPF goes towards that huge touch display. It seems a little excessive when compared to the more common 7 inch screens on some competitors machines. This screen does come into it's own however when viewing images before printing.